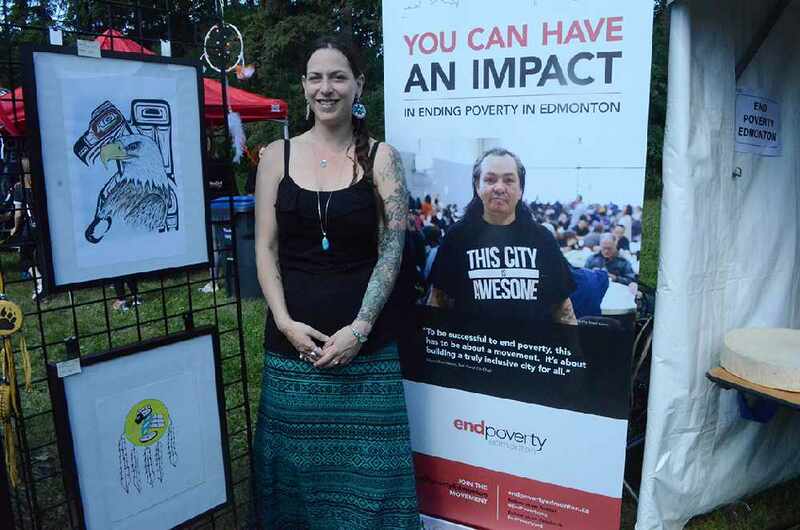 The Indigenous Circle was present at the National Aboriginal Day activities in Victoria Park today June 21 with EndPovertyEdmonton, which seeks to help Indigenous artists experiencing poverty. 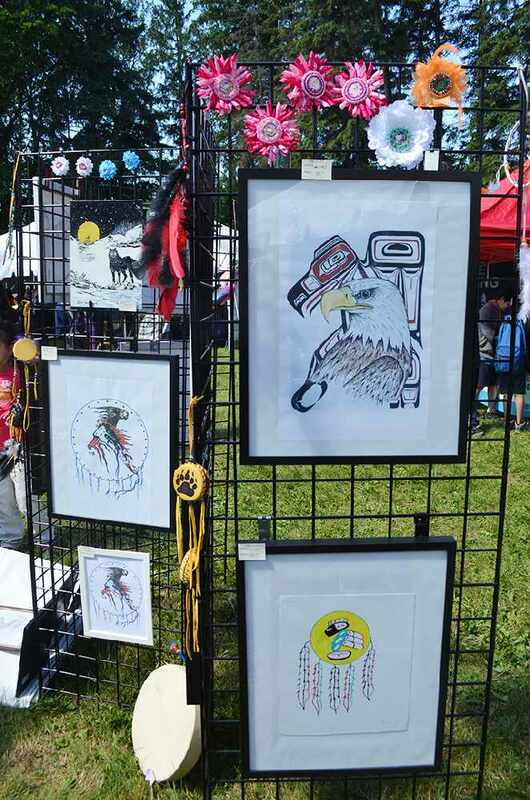 Several artists showcased their paintings, drawings, beadwork, and other arts and crafts that were for sale, with 100 per cent of proceeds going directly to the artists. There was also dancing, drumming, and singing as part of the event. From the start of EndPovertyEdmonton (EPE), a goal was for Indigenous people to help other Indigenous people find their way out of poverty. Indigenous voices were part of the shaping of EndPovertyEdmonton since its beginnings as a Task Force by Mayor Don Iveson three years ago. The first goal of EndPovertyEdmonton’s Roadmap, is “Toward True Reconciliation,” which has five starting point actions. The forth one is for Indigenous people who are experiencing poverty to “show and grow” their talents, and to find safe opportunities for this to occur. 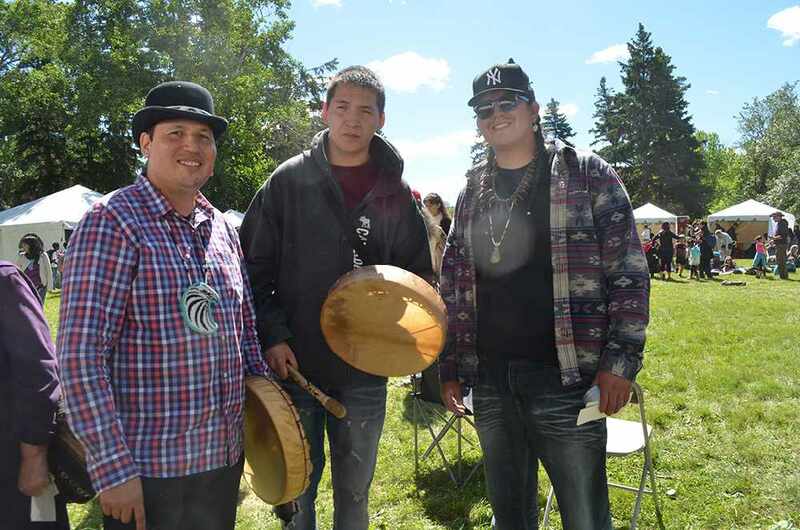 “The National Aboriginal Day celebration in Victoria Park seemed like a perfect opportunity to pilot some of the work we’ve been doing to help support our city’s most vulnerable citizens,” said Shannon Hebden, EndPovertyEdmonton Indigenous Circle Co-Chair. The artists who took part were very involved with the event and how their work was presented. “We really wanted to make sure that people, who were living in extreme poverty or surviving homelessness were aware and included in this event, from which they otherwise would likely not have the opportunity to show their work and create income,” says Hebden. 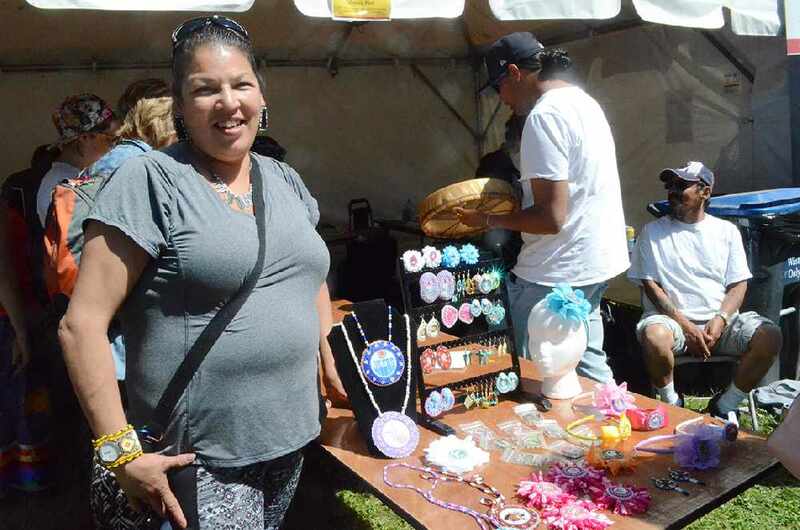 One of the artists was Donna Robillard, who creates stunning beadwork earrings and medallions, as well as drums, dreamcatchers, and hair bands. 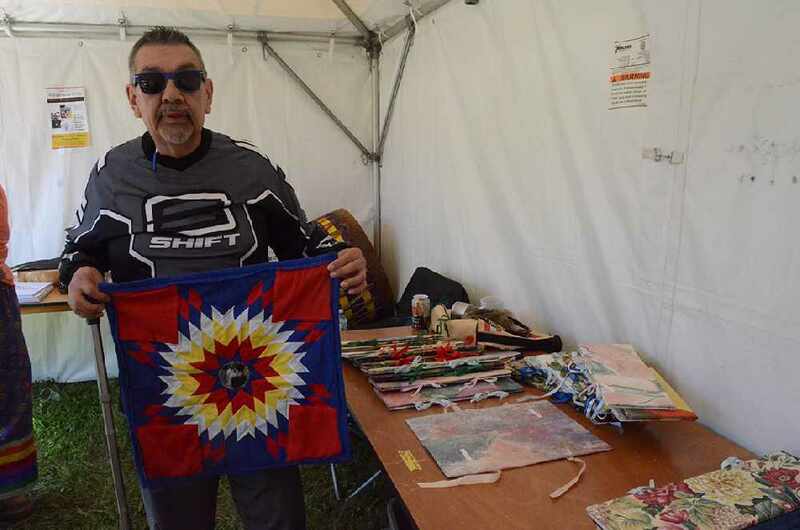 Norbert Dumais makes pipe blankets, feather cases, and general artwork. He lives at Ambrose Place, a building of social housing for Indigenous people who have lived on the streets. “Creating avenues for inclusivity and showcasing the amazing talent of Indigenous people in poverty, who are often overlooked, is very important to us,” said Hebden. Other Indigenous Circle participants were at the event helping out. 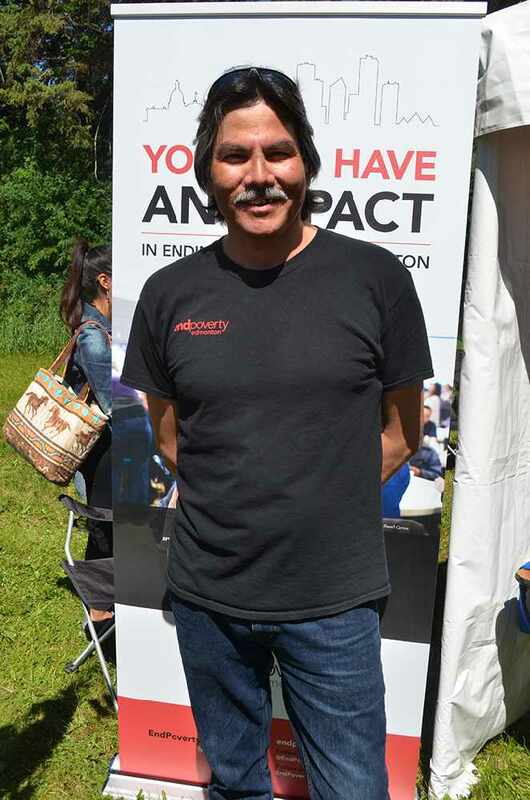 Johnny Lee is a member of the Indigenous Circle who helped out on National Aboriginal Day selling beautiful prints and drawings for artists who could not be at the event themselves, as well as give information to the public about EndPovertyEdmonton. Hebden said “the EPE Indigenous Circle is still fairly new, but deeply committed to working with the of EPE’s Roadmap actions that resonate most closely with Indigenous peoples. We start each of our meetings with sincere acknowledgement that we are on Treaty 6 territory, a traditional meeting ground, gathering place, and traveling route to the Cree, Saulteaux., Blackfoot, Métis, Dene, and Nakota Sioux. We have more ideas that are in the works,” she says.